In the autumn 2017 issue of the The Royal Society of Literature Review, the is an article with much the same title, and it’s discussing the therapeutic benefits of shared reading. The idea – a simple one – is that great books or poems are selected and read aloud in groups of two to twenty. 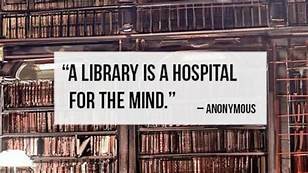 But the results might be called bibliotherapy. The Reader, a charity started by Jane Davis, and RSL member in 2008 has trained over 7,000 people in the Shared Reading model, and there are currently 300 weekly sessions across the UK, with 53 of the groups in 32 different criminal justice settings. Other settings include rehab clinics, refuges, and care homes. Shared Reading reaches out to people who were not committed readers, or who could not read, or left reading behind when they graduated, or who believe that reading is a luxury well beyond them. For those of you who would be interested in leading a reading group, there is training available. See www.thereader.org.uk.